Only amateur players can participate. Athletes who participated during the last 2 years by representing their national country in the Olympic Games or a volley ball competition organized by the FIVB (Nations League, World or Continental Championships and their qualifying tournaments, not taking into account the age group competitions for the categories under 20 years or younger) cannot participate in the CSIT competitions. In case of an unclear status the participating Union has to clarify this status by sending all relevant information to the TC Volleyball before at least 2 weeks before the single Championship or the World Sport Games. 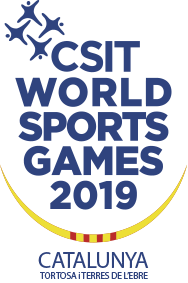 It is to decide by the TC chairman and secretary indoor Volleyball if the eligibility criteria are valid or not before sending the player(s) to the CSIT Championships or World Sport Games. Unions/parties can bring unlimited number of teams per gender ; in case of registration of more than one team , they need to have a delegation leader . Two phases : groups and then simple elimination. Format of the matchs : during the groups phase the matchs are the best 2 out of 3 sets or the best 3 out of 5 sets ( depending of the number of teams ) , during the elimination phase the matchs are the best 3 out of 5 sets . The exact system will be determinated according to the number of registered teams. teams of 6 players : always minimum 3 women on the court . age : 16 years and older . Unions/parties can bring unlimited number of teams in the Open Mixed ; in case of registration of more than one team , they need to have a delegation leader . 1) Team composition : there must be always a minimum of 3 female players and a minimum of 1 male player on the court. 2) Team’ s line up : the line up of a team must respect in each moment of a set the mandatory to have less than 3 men in the front row ( positions 2/3/4 ) . 3 ) Liberos : according to the gender , a female libero can only substitute a female regular player , a male libero can only substitute a male regular player . 4) Substitutions : not taking in count the gender ( a female player can substitute a female player or a male player , a male player can subsitute a male player or a female player ) . Format of the matchs : the best 2 out of 3 sets or the best 3 out of 5 sets ( depending of the number of teams ) .